KOLONTAR, HUNGARY. 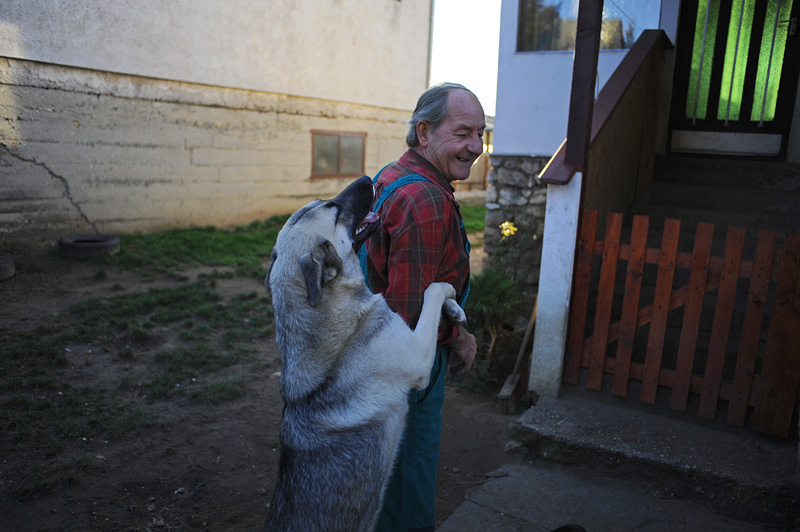 Laszlo Retnager, 63, with his dog in the yard of his home on November 25, 2010 after visiting with volunteer psychologists from the organizations Helperek who have come to Kolontar in the aftermath of an industrial accident at the MAL plant in nearby Ajka, Hungary on October 4, 2010 that sent a torrent of toxic red alumina sludge gushing through a section of Kolontar and several surrounding villages, killing ten, injuring hundreds, and leaving several families homeless. While many locals were initially resistant to their assistance given a deep aversion to a profession many thought was just to assist crazy people, many locals have warmed to their presence and welcome their guidance in a difficult time.